If you are the typical American, you believe earthquakes only happen on the West coast or in other countries. Recently, the breadbasket of America (the central plains) has seen an increase in the number and rate of frequency for earthquakes. Oil and natural gas fracking is the main reason many give for the recent surge of earthquakes throughout middle America. 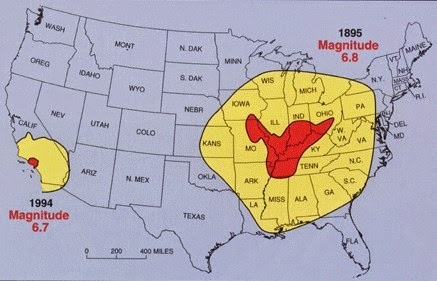 Most Americans do not know that the largest and most severe earthquakes in the United States happened in eastern Arkansas, southern Missouri, and western Tennessee, with damage throughout the central plains, before the era of oil and gas exploration The 1811/1812 series of earthquakes called the New Madrid earthquakes were the strongest in our country's history. That's New Madrid -- Missouri, not Spain. It is difficult to know the exact strength of the February 7, 1812 New Madrid earthquake since seismology had not yet been invented, but it is estimated that this quake was more powerful than the 1906 San Francisco earthquake or the 1995 Kobe, Japan earthquake that killed 5,000 people. The Mississippi River began to flow north for a season as a result of the earthquake. Homes were completely swallowed up by the ground. Houses were shaken as far away as Pittsburgh, Pennsylvania, and Norfolk, Virginia, with residents awakened by the intense shaking. [Church bells rang in Boston and in York, Ontario (now Toronto). Sidewalks were reported to have been cracked and broken in Washington, D.C. Many other strange phenomenon took place as a result of the New Madrid quake. Due to America being an infant agricultural nation in 1811/1812, and due to the rivers being frozen by winter cold, the commercial and residential damage was not nearly as extensive as it would be today. Other massive quakes have occurred in the region since 1812, including one estimated at 6.8 in 1895 (see picture above). According to the National Geographic, it is not "if" another big earthquake in the central United States occurs, but "when." “The animal knew better than I what was forthcoming, and instead of going faster, so nearly stopped that I remarked he placed one foot after another on the ground with as much precaution as if walking on a smooth piece of ice. I thought he had suddenly foundered, and, speaking to him, was on point of dismounting and leading him, when he all of a sudden fell a-groaning pieteously, hung his head, spread out his forelegs, as if to save himself from falling, and stood stock still, continuing to groan. I thought my horse was about to die, and would have sprung from his back had a minute more elapsed; but as that instant all the shrubs and trees began to move from their very roots, the ground rose and fell in successive furrows, like the ruffled water of a lake, and I became bewildered in my ideas, as I too plainly discovered, that all this awful commotion was the result of an earthquake. I had never witnessed anything of the kind before, although like every person, I knew earthquakes by description. But what is description compared to reality! Who can tell the sensations which I experienced when I found myself rocking, as it were, upon my horse, and with him moving to and fro like a child in a cradle, with the most imminent danger around me. When the earthquake retreated, the air was filled with an extremely disagreeable sulphurous odor." Now, fast forward 200 years and put yourself in a car, an office building, or a public arena. One of the benefits of knowing history is an ability to anticipate the future. While everyone in the Midwest tends to blame the oil and gas industry for more frequent earthquakes in our region, a simple knowledge of the past will remind us that massive earthquakes in the United States occur more than in just the state of California. We're a lot closer to the New Madrid fault than Oklahoma, and we've had earthquake coverage for YEARS. It's one of those "Yes ... but what IF????" deals. Can't afford not to have it. Where do you get it for that small amount? I live in ala and pay an extra 300 a year on a 150 k home. Your post was very educational…loved the story about the horse. You once wrote and said I should write a book of stories. Here is one when I was 15 and weighed less than a hundred pounds. There were a lot of us swimming in Red River. Our father had returned from being a chaplain in World War II. He stayed on the front the whole war and never lost in wrestling. His 210 pounds was solid muscle and he was strong as an ox. He was our hero. I crossed the river where it was deep, narrow, and fast. I swam with the current and it was pretty easy. Our father decided to join me, but he was a long way below me. He tried to swim upstream. The river got wide, and the current took him farther away. I followed on the bank. We were about 200 yards from the others. I saw a stake on both sides of the river where a fishing trotline could have been. He had told us about people drowning by being hooked by one. I caution him about the trotline and he swam harder. Wonder if all the quakes we've been having here in Oklahoma is stress relief for the New Madrid fault. Here in S.E. OK we've not felt anything (yet). Great post about New Madrid. If something like that happens again it's going to be a lot worse than those little California burps. The problem is even John 3:16 offends many people. Those who reject God's truth find part or all of it offensive. Mark 16:16 offends those who believe that water baptism is not essential for salvation. John 16:23 offends those who want to pray to the Virgin Mary and other dead saints. Titus 2:11 offends those who believe God's grace is only offered to a predetermined select few. Hebrews 6:4-6 offend those who believe in once in grace always in grace. THE NEW COVENANT TERMS FOR PARDON. The terms for pardon offend those who reject the terms. GOD LOVES EVERYONE, HOWEVER, SALVATION IS CONDITIONAL. Yes, but, I was reading a book fictional book about The Big One everyone thinks will hit LA some day. One thing that was brought up was earthquake insurance. The author of the book brought up that in a large earthquake hitting a large city, there would be so many people with claims that there would be no way the insurance companies could pay without going bankrupt. And, realistically, say a large earthquake or a series of large earthquakes like what happened in 1811 - 1812 happened on the New Madrid fault. Memphis gone. St Louis, Chicago, and other large cities with a lot of heavy damage. How could the insurance companies pay out the claims? What would you really get for your earthquake insurance claim? Only a fraction of what you lost in the earthquake, if anything. Just out of curiousity, have you ever read The Rift by a guy with the last name of Williams? Good fictional book about what if earthquakes the size of the 1811 - 1812 hit today. Might be out of print now, but you probably still find it. I have not! :) Interesting comment about insurance! Sounds pretty logical to me. I spent almost half a century in the Property/Casualty Insurance business. Fear not .. the insurance industry has the reserves to pay the claims, principally through the mechanism of reinsurance. Ceding and assuming reinsurance is so pervasive in the business that, after the 707 was blown up by terrorists in the desert .. which was videotaped and seen on American TV .. one of our local insurers in Indianapolis paid $7.00 toward that claim. And the Piper Alpha oil rig that blew up in the North Sea produced over one million reinsurance entries at Lloyd's, London. I was told of that by our Lloyd's Broker on a visit to Lloyd's, in fact. You quote Mark 16:16: “Anyone who believes and is BAPTIZED will be saved…” (NLT) and conclude it offends those who do NOT believe baptism is essential for salvation. It’s said, “Actions speaks louder than words.” So what did Peter believe when the Gentiles were baptized in the Holy Spirit when they spoke in tongues BEFORE he stopped preaching and BEFORE they were baptized? My father believe that “miracles” stopped after the apostles because they were not needed to show that Jesus was God’s Son since we had the Bible and the Holy Spirit to teach and guide us. I agree that John 16:23 offends those who pray to Mary. We that believe “once saved…always saved” are not offended by this Scripture because of two words: “impossible” and “if”. I totally believe in fracking for gas & oil but the central states are starting to see quakes up to the 4 & 5 range from what looks like fracture damage. Are they fracking close to Enid? Am I the only one that is willing to take the time to say the Bible teaches “Once saved, always saved”? John 3:16 has no ‘ifs’, or ‘buts’. “Today, you will be with me in Paradise” did NOT have any ‘Ifs’. That is why in the Uniform Building Code, the area around New Madrid and St Louis is "Seismic Zone 3" -- the same seismic zone rating as Southern California and San Francisco Bay Area. Lloyd's of London paid off their claims on the 1906 San Francisco earthquake, and that leveled the city. Lloyd's told their agents in San Fran to pay on all claims. All the people come to L.A. When there's no more San Francisco? To tie up your boat in Idaho..."